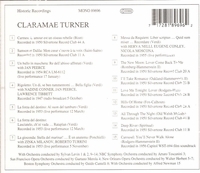 “Renowned for her lustrous voice, Claramae Turner sang more than 100 times with the Metropolitan Opera. But she is best known — or, more precisely, best unknown — for having introduced ‘I Left My Heart in San Francisco’, the sentimental ballad indelibly associated with Tony Bennett. That song, with music by George Cory and lyrics by Douglass Cross, was written for Ms. Turner, an operatic contralto, in the early 1950's and published in 1954. She sang it often as a recital encore. Then along came Mr. Bennett, who had a hit with it in 1962, won two Grammy Awards for it (record of the year and best male solo vocal performance) and has lived with it happily ever after. Mr. Bennett’s recordings of the song have sold millions of copies. It has also been recorded by Frank Sinatra, Dean Martin, Judy Garland, Peggy Lee, Duke Ellington, Louis Armstrong, Tennessee Ernie Ford and a torrent of others. Ms. Turner was also known to audiences as Cousin Nettie in the 1956 film version of CAROUSEL, the Rodgers and Hammerstein musical. In that picture, which starred Shirley Jones and Gordon MacRae, Ms. Turner sings the enduring standards ‘You’ll Never Walk Alone’ and ‘June Is Bustin’ Out All Over’. At the Met, where Ms. Turner appeared regularly from 1946 to 1950, her roles included Amneris in Verdi’s AÏDA, Marcellina in Mozart’s NOZZE, Erda in Wagner’s SIEGFRIED and Auntie in Britten’s PETER GRIMES. Reviewing her Met début, as Marthe in Gounod’s FAUST, in The New York Times, Noel Straus wrote, ‘Miss Turner accomplished some of the most able vocalism of the evening’. He added, ‘Hers is a warm, rich voice, admirably trained’. Claramae Haas was born 28 Oct., 1920, in Dinuba, Calif., near Fresno. She got her start, fittingly, in San Francisco, as a chorister in the San Francisco Opera. She progressed to leading roles with the company, including Azucena in Verdi’s TROVATORE and Madame de Croissy in the United States stage premiere of Poulenc’s DIALOGUES OF THE CARMELITES in 1957. In New York, Ms. Turner sang the original Madame Flora, the title character of Menotti’s THE MEDIUM, which had its world premiere at Columbia University in 1946. After leaving the Met in 1950, Ms. Turner performed regularly with the New York City Opera, where she sang Carmen, Madame Flora and many other roles. During this period Mr. Cory, a friend from her San Francisco days by then unhappily transplanted to New York, began work on ‘I Left My Heart’ for her. Ms. Turner’s discography includes Humperdinck’s HANSEL AND GRETEL; THE TENDER LAND, by Aaron Copland; and the Verdi REQUIEM.